Register for our next event here. Find the event you would like to attend in our updated list below. Click or tap on “Register Now” & you will be taken to that event’s registration page where you can sign up. Dressler’s 12:00 – 1:30 p.m. There has been little or no innovation in the cross-border trade industry since forever. 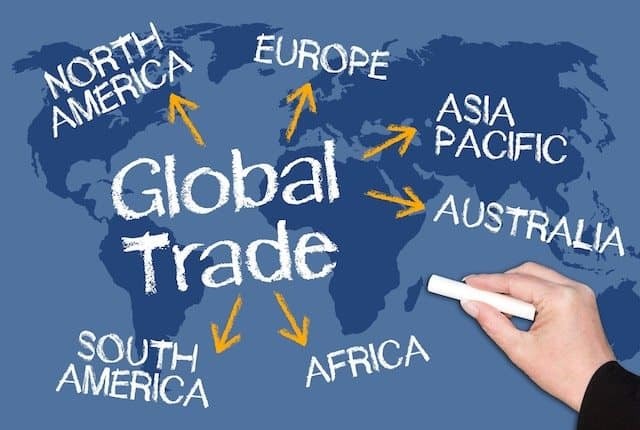 Global trade has conventionally been a manual process generating tons of documents such as letter of credit or product quality papers. Blockchain is a tamper-proof, decentralized and distributed digital record of transactions that create trust and is highly resilient. The World Trade Organization agrees: Blockchain’s potential trade-related applications are numerous and could significantly transform international trade. Blockchain could open new opportunities to enhance the efficiency of processes, help trade move closer to becoming paper-less, help administer intellectual property (IP) rights in a more efficient and transparent way and help fight counterfeits and enhance government procurement processes. Beyond sectoral specific applications, Blockchain opens multifaceted cross-cutting opportunities. Blockchain could help build trust and enhance the transparency of supply chains. Blockchain has the potential to reduce a variety of trade costs substantially. Blockchain also opens up new opportunities for micro, small and medium-sized enterprises and small producers from developing countries. However, these opportunities will only be realized if several key challenges are addressed, including technical issues such as scalability, interoperability, and legal issues. Join us at our favorite lunch spot, Dressler’s Restaurant on November 15th from 11;30 to 1:00 for networking, a delicious lunch and James’ view of trade from Capitol Hill. Join us for an evening of networking this month at the Olde Mecklenburg Brewery with Bart Carmichael from Edward Jones. Positioning Charlotte to Attract International Investment and Business. We are pleased to bring you another exciting season of programs starting with an update from Ronnie Bryant President & CEO of Charlotte Regional Partnership. As president and CEO of the Charlotte Regional Partnership, Ronnie Bryant leads the economic development organization that promotes the 16-county Charlotte USA region as a premier location for businesses considering expansion or relocation. With more than 35 years of technical, managerial and economic development expertise, Bryant is nationally known for his proven track record of establishing and implementing successful economic development programs, with a strong emphasis on existing industry expansion and retention, regionalism and marketing. Bryant, a certified economic developer (CEcD) since 1991, is a graduate of Louisiana State University in Shreveport and the Economic Development Institute at the University of Oklahoma (OU/EDI) in Norman. While attending OU/EDI, he received the American Economic Development Council’s Robert B. Cassell Leadership Award. He previously served as dean of OU/EDI, and is currently a member of the Executive Board and a member of the OU/EDI faculty. Bryant is well known in economic development circles. He is a past chairman of the board for the International Economic Development Council (IEDC), which has designated him as a Fellow Member (FM) and an Honorary Life Member (HLM) for furthering the profession of economic development as a teacher and inspiration to others in many communities. His other professional affiliations include the International Asset Management Council (IAMC), the Urban Land Institute (ULI), and both the North Carolina and South Carolina Economic Development Associations. Bryant’s civic participation includes board memberships with the John S. and James L. Knight Foundation Charlotte Community Advisory Committee, the YMCA of Greater Charlotte, Charlotte Research Institute, Aspire Capital Development Corporation, The Federal Reserve Bank of Richmond’s Charlotte Industry Roundtable, the Charlotte City Club, Jazz Arts Initiative and The North Carolina Blumenthal Performing Arts Center. Jointly presented by the Carolinas Chinese Chamber of Commerce (CCCC), the Carolina World Trade Association (CWTA) and K&L Gates. We hope you will join us for an insightful and interactive discussion with this panel of prominent international trade experts. The Equestrian World comes to Tryon N.C.
Join us to learn about the Tryon International Equestrian Center, Tryon Resort and the upcoming FEI World Equestrian Games that will be held September 11- 23, 2018 just 70 miles west of Charlotte. Over 500,000 spectators, 70 countries, 1000 horses and 1500 riders are expected to ascend into our area. Don’t miss this opportunity to learn more about the business vision, present and future, as well as understand the economic impact potential for NC directly from Tryon’s Chief Operating Officer and former NC Secretary of Commerce, Sharon Decker. Join the Carolina World Trade Association to hear Eric Kohout International Logistics Manager from Samaritan’s Purse. The Broken Spoke and Great Wagon Road Distillery – tour and tasting of the gold medal award winning spirits with Owner Ollie Mulligan. Our upcoming Leadership in Commerce Awards will be held on June 5th, 2018 at 6PM at the Myer’s Park Country Club. Click below to download our event flyer with all the details, or check out our honorees for the evening. See our memberships and register! Join our group today and experience all the benefits to you and your business throughout the year! Make great connections, grow your network, discuss issues that matter, and be plugged into the most “global” local group here in Charlotte!